The Salt Palace Convention Center is located in the heart of downtown Salt Lake City, Utah and serves as the center of many of the city’s activities. When its EPDM roof was nearing the end of its life cycle, property owner Salt Lake County felt the timing was right to convert the roof into a solar generating system. The completed project would be the largest roof top array of solar energy in the nation. The proposed 2.6 megawatt solar installation was ultimately scaled back to 1.65 megawatts, but is still one of the largest projects to date in the United States. It spans 600,000 square feet — about the size of ten football fields. CQR was a critical component in both the re-roof, as well as the installer for Bella Energy’s solar panels along with a local contractor who made the electrical connections. Considering the scope of work, tight timeline, massive scale, the unforseen issues that arose, plus the building’s ongoing events, as well as zoning restrictions (both of which dictated when work/where work could be done), it was a complex project. However, the critical management of the project reached new levels when it became a high-profile public relations event as part of the mayor’s campaign for Governor. The project had two phases: the new re-roof installation and the solar panel installation. Each came with its own challenges which CQR solved through experience and innovation. Roof Challenge #1 – Remove and replace half a million square feet of roofing in ten weeks within zoning restrictions. 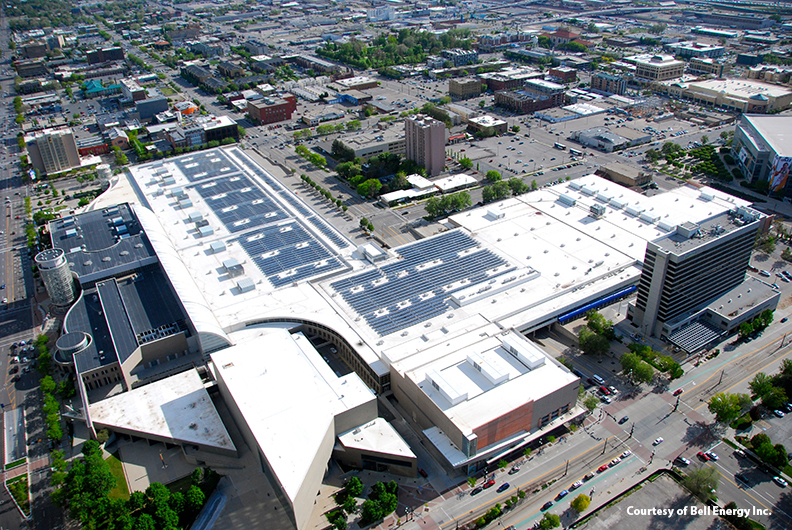 Crews needed to remove and install almost 10,000 square feet each day The Salt Palace Convention Center needed to replace its roof before the planned 2.6 megawatt system solar installation could begin. Initially they determined that a General Contractorwould have to be hired and multiple roofing companies would need to work simultaneously in order to complete the work in time for the solar panels to be installed. Solution #1 – One contractor with multiple crews. Using multiple companies would add unnecessary complexity to the project. Clark’s Quality Roofing provided enough crews from within its own company to complete the job using only one roofing contractor. CQR assigned 40 men to the project who were divided into demolition crews and installation crews. Zoning restrictions prohibited working through the nights, so the demolition crews worked early in the morning, late in the evening, and through the weekends to prepare the way for the installation crews. 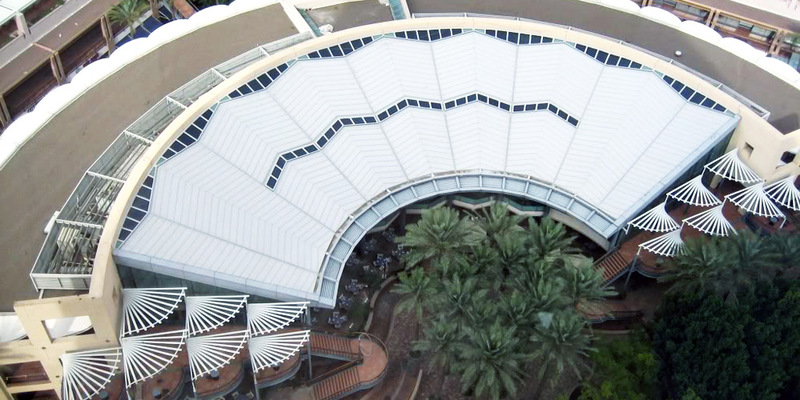 Roof Challenge #2 – Work around the convention center’s schedule to avoid disruption to ongoing events. 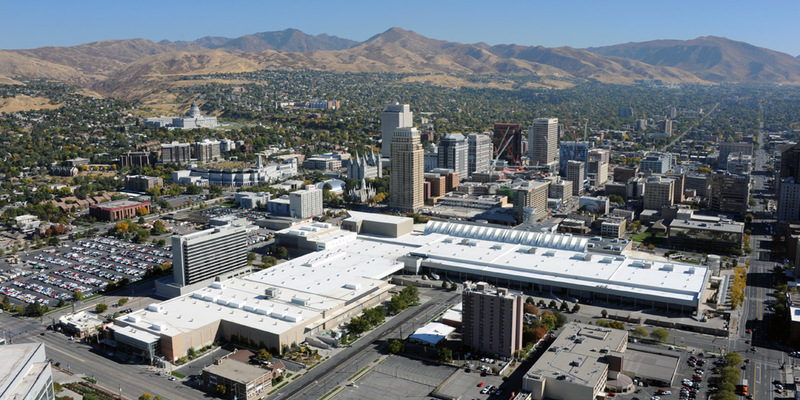 The Salt Palace Convention Center has 515,000 square feet of exhibit space; 164,000 square feet of meeting space, including a 45,000 square foot grand ballroom; and 66 meeting rooms. It hosts thousands of events each year. It is the home of the Outdoor Retailers show, which is the center’s largest event. The 2013 show hosted 998 exhibitors and 21,814 attendees. The seven-day set up, four-day show, and another seven days of take down took place right in the middle of the project. Solution #2 – Determine how to manage the tight schedule with limited access and work hours while staying on schedule. CQR took the event schedule for the ten-week period and created a weekly installation schedule that didn’t disrupt current events. The center’s constant schedule changes and new events, however, showed the need for flexibility on a daily basis. At the beginning of each day, CQR sent the plan for the following few days to the Salt Palace administration, the event sales team, and the facilities operational staff. If there were any schedule changes or new events or other conflicts, they would notify CQR who would reroute the workers to more optimal locations. Roof Challenge #3 – Coordinate and communicate activities with 10 separate involved parties. The project became a highly-publicized public event after the mayor announced his candidacy for governor and ran his campaign around a “green” platform. The added publicity required CQR to keep the mayor’s office and campaign headquarters up to date and offer opportunities for public relations moments. Clark’s was also required to coordinate and communicate with the county purchasers, the roofing consultant, the design team for the roofing, and the design team for the upcoming solar system.Solution #3 – Create a reliable communication coordination system. CQR assigned a color to each crew and created a color-coded monthly schedule that displayed which exhibit hall each crew was assigned to each day. The assignments were closely correlated with the 10-week installation map. A daily completion spreadsheetwas also put together each day showing the actual work completed. The communication documents were designed to be easily understood and useful for both construction personnel and political personnel. These documents, along with photos of the current progress, were emailed to more than 20 people each day. Roof Challenge #4 – Meet the stringent “Green Project” requests of the mayor’s office. Solution #4 – CQR modified our work to follow LEED guidelines. Carlisle was chosen to provide the TPO membrane which was produced at a local plant. Hunter Electic provided the insulation that was also produced locally. The 760 tons of old ballast was removed and delivered to Salt Lake County Parks to be re-used in landscaping projects. The old EPDM membrane was saved for county residents for use in landscaping, weed control, pond lining, tarps, and other general purposes. Roof Challenge #5 – Unexpected electrical conduit lines were discovered. Electrical conduit lines were found during the removal of damaged insulation. Solution #5 Discover and diagram the conduit so that it would not be damaged during solar system installation. CQR lifted each insulation board to locate all electrical conduits. Then the insulation was marked at each location to avoid damage from fastener penetrations. Each of the additional layers of foam was also marked, and small marks were put on the membrane. CQR used this data to create a map to use during the solar system installation and to give the building owner for their records. Roof Challenge #6 – The only access to the roof was not convenient for the large number of people who needed access. Many people wanted access to the roof to view the solar array that would be installed soon, but the only access was up a ladder and through a small hatch. They needed better access to the roof while at the same time they needed to protect the roofing membrane. CQR had built elevated walkways on another project. They took the architect to the project and proposed a similar system to him. A stairway replaced the ladder, plus a small enclosure was built over the stairway. The enclosure opened onto an elevated metal platform which was designed to be attached through limited anchor points that were easily integrated into the roofing system. The observation platform protected the roof, as the observers did not step onto the roofing membrane. Bella Energy was contracted to design and purchase the solar array. Bella worked closely with CQR, who was invited to be part of the design team to offer techincal expertise on the mounting system that would integrate best with the existing roof system without compromising the warranty. During this time, Nex-Gen, the company that was going to own and operate the system, withdrew from the project. This delayed the project an entire year while new funding was acquired. The project was scaled back to 1.65 megawatts, which is still one of the largest projects to date in the United States. During this time Clark’s continued to consult with the design team to create a system that would be integrated into the roofing system without inhibiting the roof’s ability to perform as designed. After the funding was in place and phase two could begin, Bella Energy asked Clark’s Quality Roofing to install the solar panels and a local electrical contractor was hired to perform the electrical connections. There were several challenges that arose during this solar system installation phase of the project. Solar Challenge #1 – Hoist the fragile solar system onto the newly installed roof without damaging the roof or the solar panels. It took 26 semi-truck loads to deliver the solar system—11 semi-truck loads of fragile solar panels and 15 semi-truck loads of beams, rails, bolts, nuts and connectors for the support system. The solar company had hoped to be able to deploy a crane large enough to set panels and rails to each side of the installation area to minimize movement of the fragile panels. The roof, however, was 70’ high and the average distance to the staging area from the roof edge was 350’. This prohibited setting the boxes containing the panels in the optimal locations. The boxes had to be set at the edge of the roof and then transported across the roof to the installation area. Delivery unloading areas were limited. Ground storage was limited and available unloading locations changed with the convention events. Solution #1 – Deliveries were staggered and scheduled between events. On available days, two to three truck loads were delivered. The solar panels were always hoisted directly onto the roof to prevent theft. When changing schedules prohibited loading all of the panel support system components onto the roof, the components were placed out of the way if events would allow temporary storage on the ground. When this was not possible, the excess materials were taken to CQR’s yard 10 miles away and stored until needed. Staging areas on the roof were covered with polypropylene separator material and sacrificial membrane and then covered with plywood to protect the roof. Some pallets of components were simply placed on used roofing insulation. Solar Challenge #2 – Transporting 286 crates of solar panels, as well as 1,000’s of pounds of support rails and beams, across the roof and then storing them in a way to prevent damage until they could be installed. Each box of solar panels weighed over 1,500 lbs. and contained $20,000 of solar panels. Opening the box and transporting each of the 21 panels individually across the roof and then storing and protecting them from damage until they could be installed would be too difficult and too risky. Transporting the heavy support beams and rails — some up to 40′ long — presented the same problem. Solution #2 – Unique carts were designed and built by CQR. None of the commercially available carts were capable of lifting the heavy solar panel boxes or heavy rails and beams and transporting them without damaging the roof. In response, CQR designed and built its own carts. An 8-wheeled cart was developed for the panels and a tilting 6-wheel cart was developed for the support system. Each evenly distributed the weight of the crate even when the crate was lifted and put back down. Multiple prototypes were made before a strategically placed off-set hinge bracket achieved the goal of equal weight distribution. CQR then used the carts to transport the items to the desired location. The panels were kept in the shipping boxes, which protected them until installation. 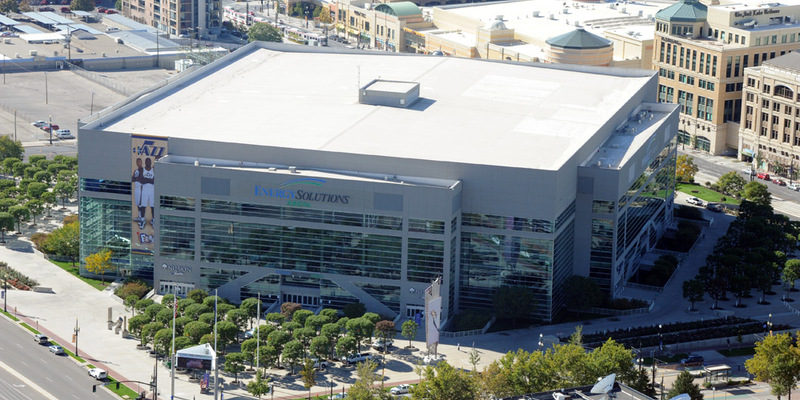 The Salt Palace Convention Center re-roofing and solar installation project was successfully completed on time and under budget, with the desired results, look, quality workmanship, and innovative solutions for which Clark’s Quality Roofing is known. The project required more than 14,000 man hours. There were zero change orders, zero OSHA violations, and zero injuries. This high profile, public project had the attention and interest of many business and political leaders, who were promoting its green benefits. The project’s social and political messages could not afford to be marred by problems, and its operations had to meet the tightest of deadlines and stringent budgets while delighting the local voters. CQR was able to use its skill and over 30 years of experience to achieve the desired success. The project architect commented in the final meeting that he could not believe how few problems the job encountered, thanks to the fact that many potential problems were anticipated and workable contingency plans were developed in advance. The county purchaser assigned to the project said this was the best managed project in her 20 years of service.